Cloud Boat aka Tom Clarke and Sam Ricketts are back with their second album following last year's critically acclaimed 'Book Of Hours' debut. 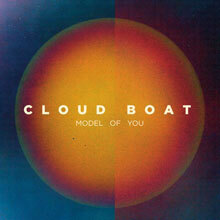 One listen to 'Model Of You' tells you that Cloud Boat are not the same band they were 12 months ago. Richer, heavier, more adventurous. This is an emotional record untethering themselves from the past sailing into deeper waters. The man charged with helping Cloud Boat navigate this new course is Andy Savours, the English producer who has worked with the pair's favourite bands such as My Bloody Valentine, Sigur Ros and The Horrors.